The Publishing Institute is officially over. Ceremonies were held, projects judged and goodbyes said. During the first half, I worked as web editor for the prototype magazine Going, a travel publication. I couldn’t have been happier with the subject matter or my group. The next half of the program, I used the left side of my brain as sales manager for a graphic novel imprint. Numbers, numbers and MORE numbers. Way to whip my brain into shape! The day after it finished, I plane hopped to Savannah and spent a week in South Carolina. I rode my bike to the pastry shop for breakfast and spent my afternoons on the beach with my sweet, little nephews. There were morning walks on the beach, wave-wipe outs (where sand gets everywhere) and late afternoon swims in the pool. After my week on Hilton Head Island, I was relaxed, sun-kissed and totally stuffed from all of the wonderful calabash seafood and family cuisine! Did I mention my mom and sister are amazing cooks? Exactly what one needs when wearing a bathing suit every day. From there, my plane took a nose dive further south to Joanna in Nicaragua. She’s been living there for the past two years while in the Peace Corps. We spent 10 days back-packing from one city to the next. We hiked a few volcanoes, went swimming in a natural spring and met some of the gracious people Joanna has built relationships with over the past two years in her town called La Fuente. While the pace of the South and Nicaragua are similar, the cultures could not have been more different. In Nicaragua, the workd ay begins around 5 am and ends by 11 that morning. No one wants to risk darkening their skin in the sun. Marriage doesn’t necessarily mean monogamy. Catcalls are frequent. There are even horns with the infamous whistle for drivers to blow at women. And when beggars ask for money, people usually give it regardless of their own income. I met so many generous, kind-hearted people. Catching a ride with a passerby was easier than hailing a cab in this city. All of this was a bit of a shock after working a full-time job, then diving into six weeks of intense lectures and project sessions. I left NYC to the land of fried chicken and “hey ya’ll,” then arrived in a country where my only communication skills included asking where the nearest bathroom was and counting to eleven. Random Italian words even flared up in my attempts at conversation. I am proud to say I was able to entertain with my numerical counting though – at least for about 20 minutes until Joanna returned. My own job hunt was put into perspective when I learned that about 50% of Nicaraguans are either unemployed or underemployed. There was evident poverty and yet beauty everywhere – a place of true extremes. When I got off my flight at JFK and trekked back to my Harlem abode, I was shocked at the cleanliness of the subway. Yes, shocked! Two years ago, I was appalled at the trash and stench when visiting NYC after London. Perspectives change, and for that I am humbled and grateful. The wind was whipping around the tall skyscrapers as I sped around the Woolworth building, through the side entrance and up the escalators into a large classroom where West Coast meets East Coast and students have travelled from as far as Singapore for one pursuit – publishing in the Big Apple. And here I am, one among a hundred who gets excited each time we’re handed a new magazine to review before one of the brand dignitaries appear in our class. This is just our first week, and we have five more weeks to go in the Publishing Institute at NYU. 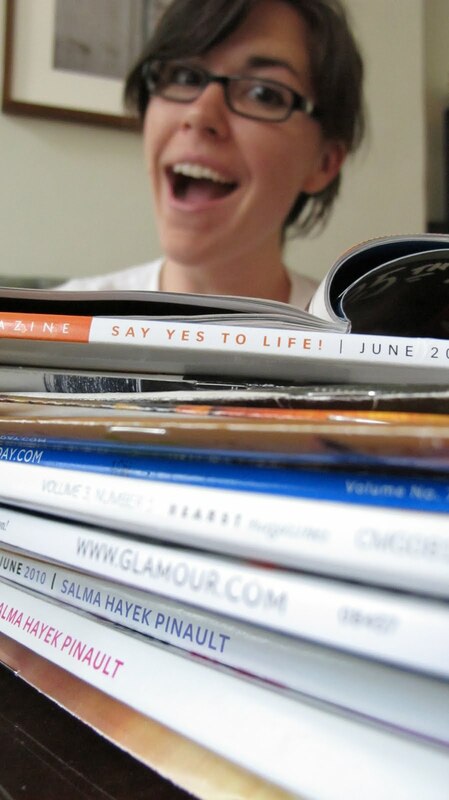 Imagine this – diet coke, stacks of magazines and a lovely new pair of glasses. I’m ready for whatever they throw at us…though a large blueberry muffin might be nice around 11 am when my stomach realizes lunch isn’t for another hour! On Thursday, we all escaped the classroom for a few hours. My group embarked towards midtown to the Hearst building, where we strolled by Good Housekeeping and spent over an hour with two editors at Marie Claire. We met in one of the editorial conference rooms, where the magazine boards had cutouts of the September issue. (I’m not sure if this is exactly insider news, but I did see pictures of Dakota Fanning). I couldn’t help wondering how anyone got any work done there when they filmed the reality show, “Running in Heels”? If this perhaps slipped past your TV memorabilia, you missed dramatic interns flitting around an office all day on the Style Network. Yeah, I definitely watched that for about half a season. The two editors we spoke with, however, were amazing. Both were down to earth and more than happy to talk to us about how they got to where they were. This went against the whole Miranda Priestly typecast from “The Devil Wears Prada.” There were no coats being slung or harrowing looks. My other ah-ha moment came when I was running down an escalator one rainy evening after a day of classes to make the train I heard approaching. Ever notice those signs reminding you not to run down stairs? Maybe next time you should take heed. I reached the bottom of the escalator quicker than I intended and received a bloody elbow as the result. I did make my train – much to the alarm of a cop who tried to insist that I sit down after my tumble. Tomorrow evening, we have an Alumni Party with graduates from other classes. I’m debating my black heels, but after the escalator incident and other unmentionable moments the past week, flats sound sturdy. I need sturdy…at least on a Monday.